Free Trade Agreements have proved to be one of the top ways to open up alien markets to U.S. exporters. Trade Agreements decrease barriers to U.S. exports, and protect U.S. benefit and improve the rule of law in the FTA partner country. The reduction of trade barrier and the making of a more stable and visible trading and investment surroundings make it easier and cheaper for U.S. companies to export their products and services to trading partner markets. 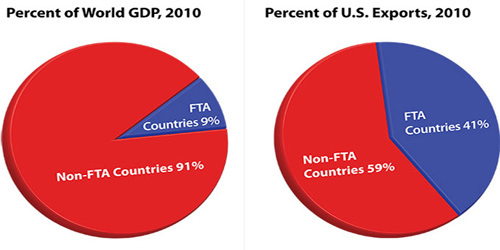 Forty-one percent of U.S. goods export went to FTA partner country in 2010, with exports to those countries mounting at a faster rate than export to the rest of the world from 2009 to 2010, 22% vs. 19%. The U S has 12 FTAs in force with 17 countries. In adding, the U S has negotiated FTAs with Korea, Panama and Colombia, but these agreements have not yet entered into force. The United States is also in the progression of negotiate a regional FTA, the Trans-Pacific company, with Australia, Brunei Darussalam, Chile, Malaysia, New Zealand, Peru, Singapore and Vietnam. Labels: Free Trade Agreements, FTA partner country, United States.